I’ve been part of the state-wide Fall Foliage Open Studio Weekend yesterday and today and have had lots of interesting visitors. 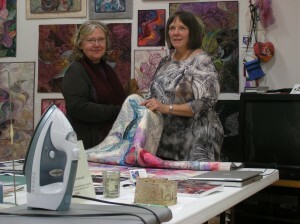 I’ve enjoyed showing my quilts, explaining my process and answering questions. 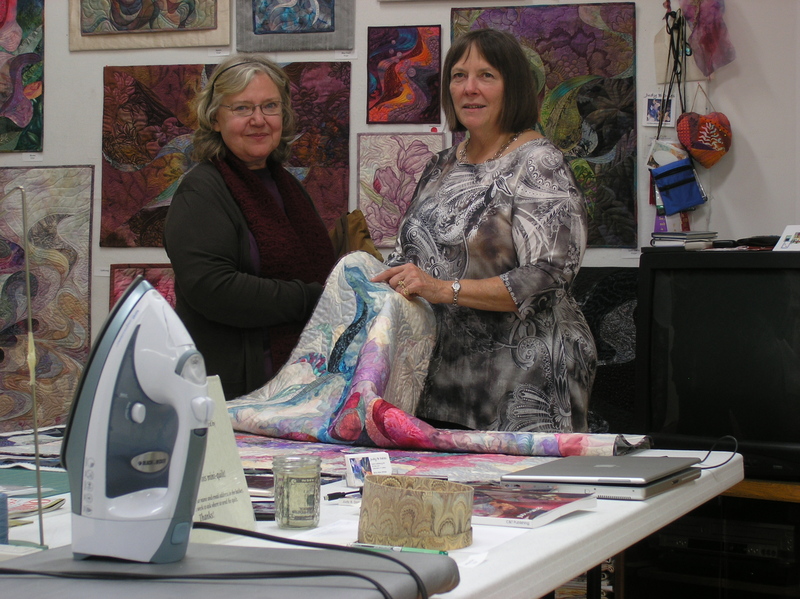 Many folks have never seen an art quilt before and my studio is a real eye-opener for them. Here I am with one visitor whose husband Steve kindly took this photo……. By far, the biggest attraction is my stash! It covers one whole wall of my studio and is looking very neat and tidy after three days of neatening, fluffing and primping. People are fascinated by the sight of so much fabric and the first questions is always about how it is organized–or not! I don’t actually organize my fabric because rummaging through random piles is part of the fun and serendipitous things happen when you are looking, but are not quite sure exactly what you are looking for!! 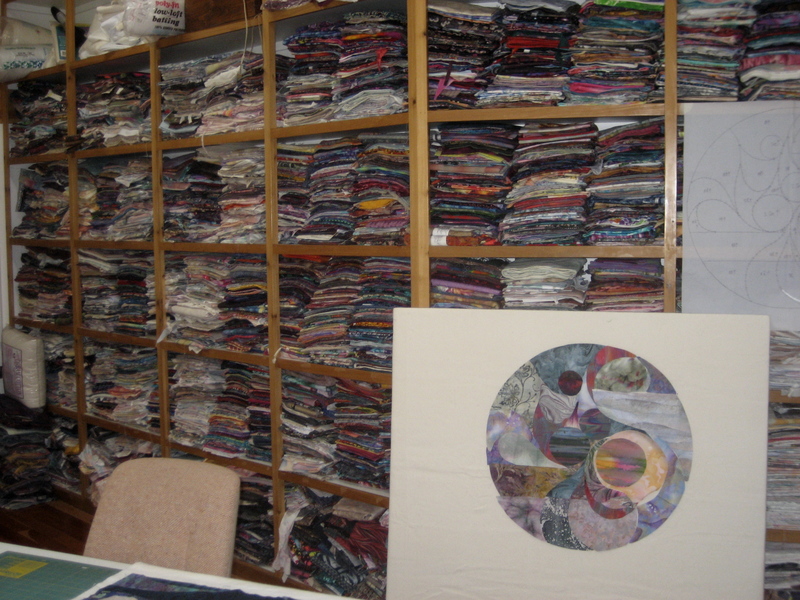 I like to explain my process so that people can appreciate the work and creativity that go into an art quilt. 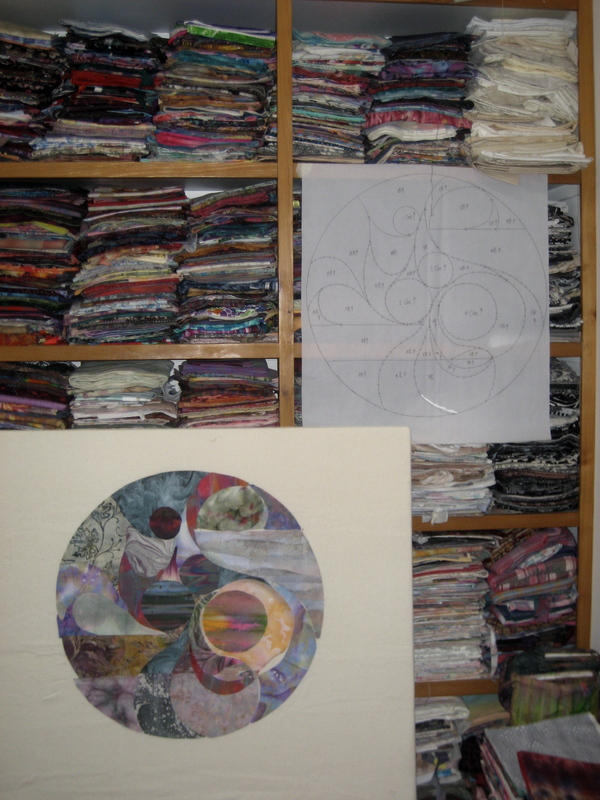 I have on display a small drawing, the large master pattern and a design that is cut out and ready to sew, which allows me to talk about the design process and how I approach it. People are usually fascinated with the creative process and learning about how something is made gives them a true appreciation for the work that they are looking at. 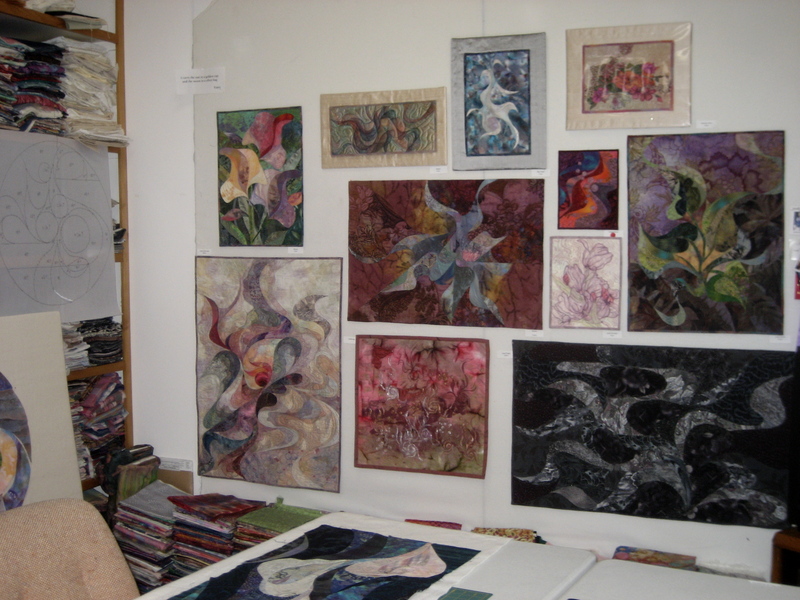 Of course, I also have quilts for sale, and here you see a selection on the design wall. My studio functions very well as a place to work, but I didn’t really plan a place to display the finished art. So my design wall is doing double duty this weekend! The only trouble with being a participant in Open Studio Weekend is that I can not go to visit other artists’ studios. 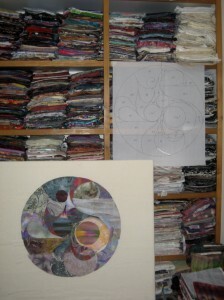 I love to see how other artists work and how they have organized their space.